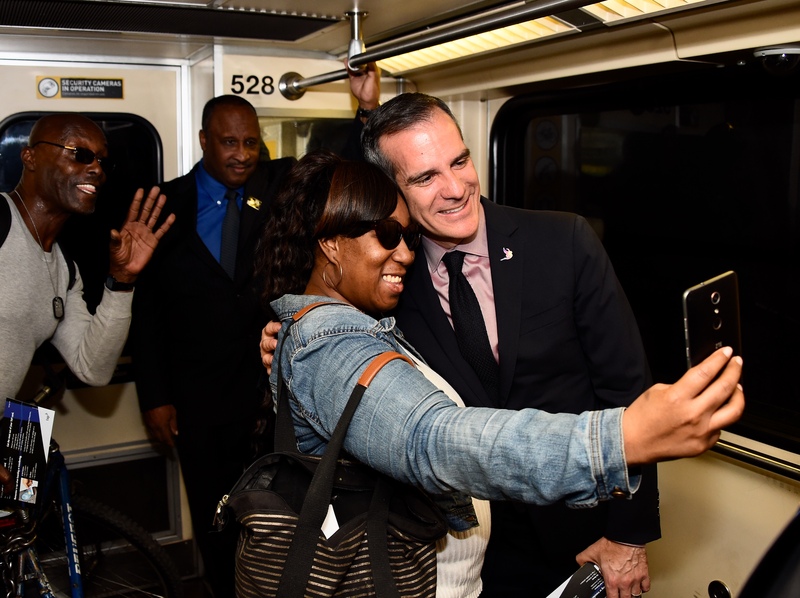 Above and below, L.A. Mayor and Metro Board Chair Eric Garcetti greets passengers on the subway this morning. Photos by Juan Ocampo for Metro. 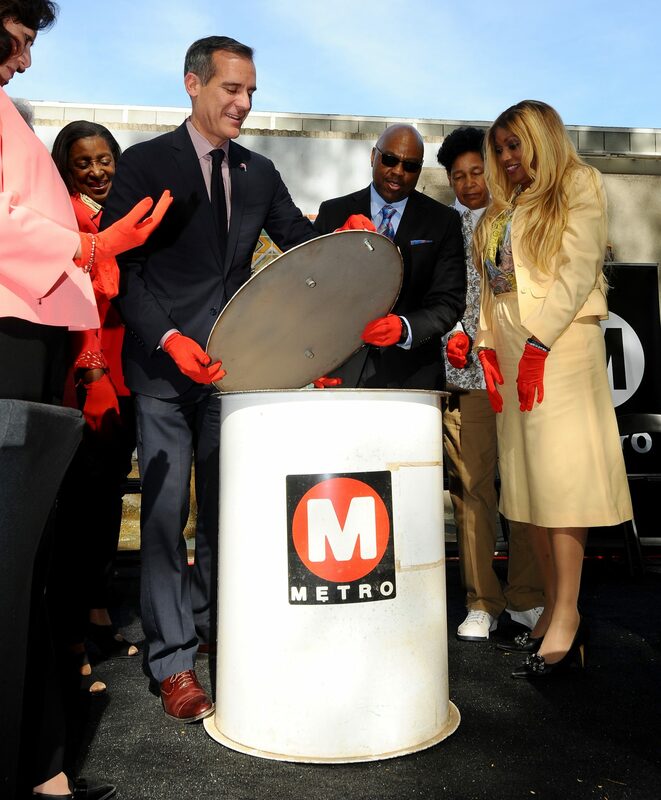 Metro CEO Phil Washington at today’s press event along with (from left) Garcetti and Metro Board Members Hilda Solis, John Fasana and Jacquelyn Dupont-Walker. At right is former Board Member and Santa Monica Council Member Pam O’Connor. 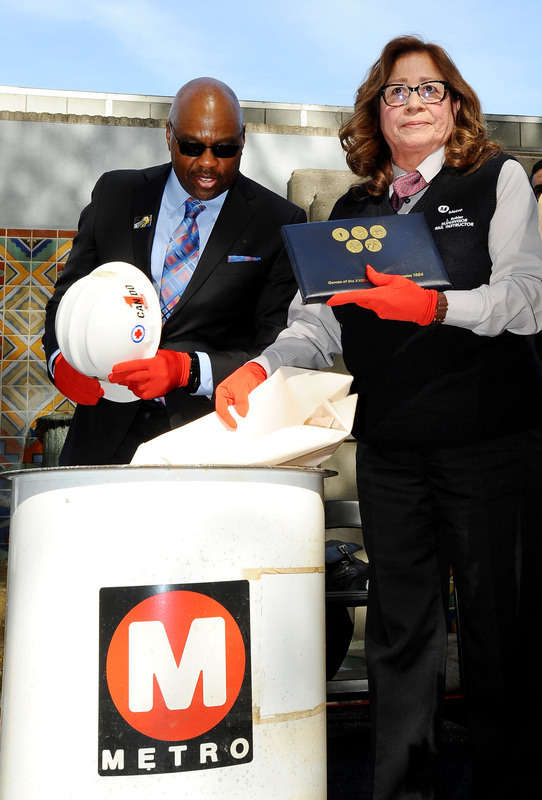 A time capsule buried when the subway was originally opened is unsealed at Monday’s press event. Contents included a copy of the L.A. Times, Olympic pins, a hard hat and a small piece of train tracks. 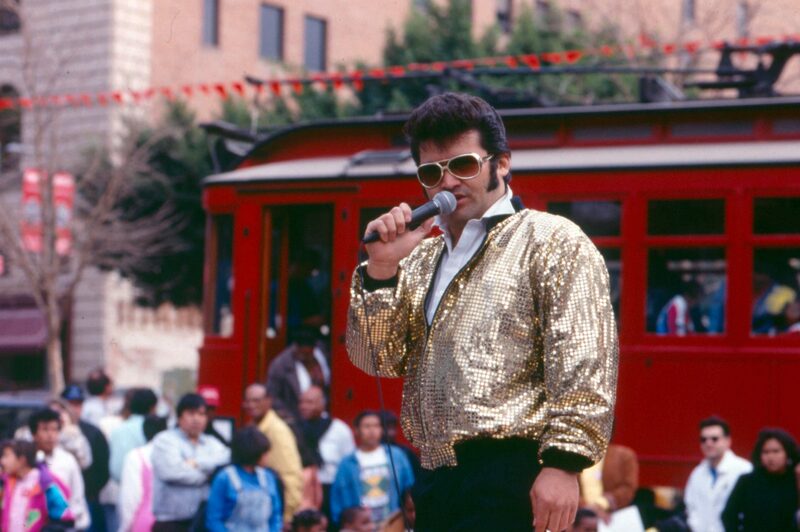 An Elvis impersonator performing at the Grand Opening Ceremony for the Red Line’s first segment in downtown Los Angeles. Photo: Metro Transportation Library and Archive. 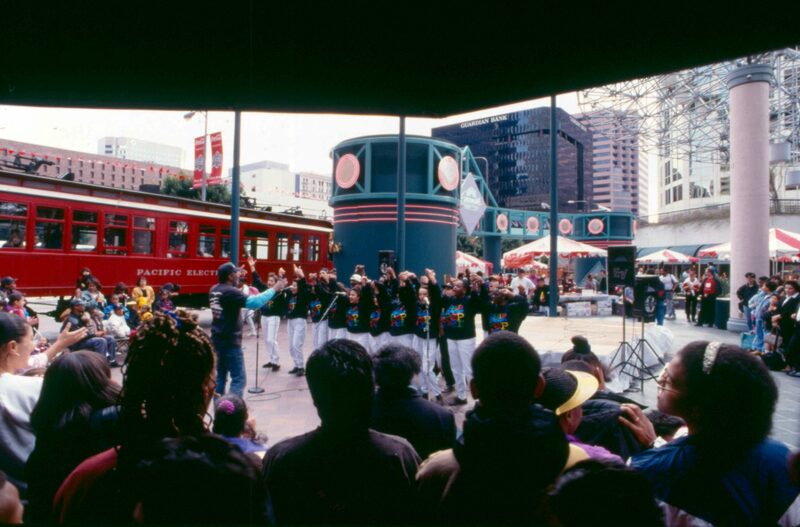 A youth group performance at the Grand Opening Ceremony for the Red Line’s first segment in downtown Los Angeles. Photo: Metro Transportation Library and Archive. 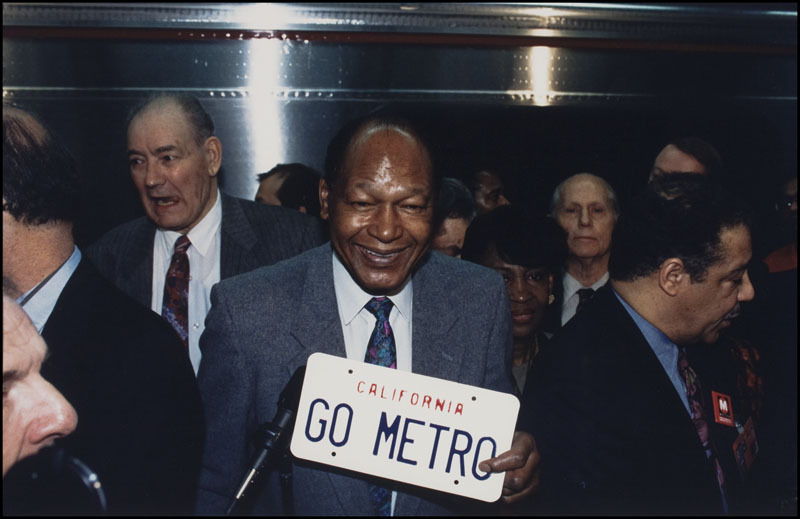 Mayor Tom Bradley – Metro Red Line Subway grand opening, 7th/Metro Station. January 29, 1993. Photo: Metro Transportation Library and Archive. The first segment of the Red Line subway opened Jan. 29, 1993 — 25 years ago today. 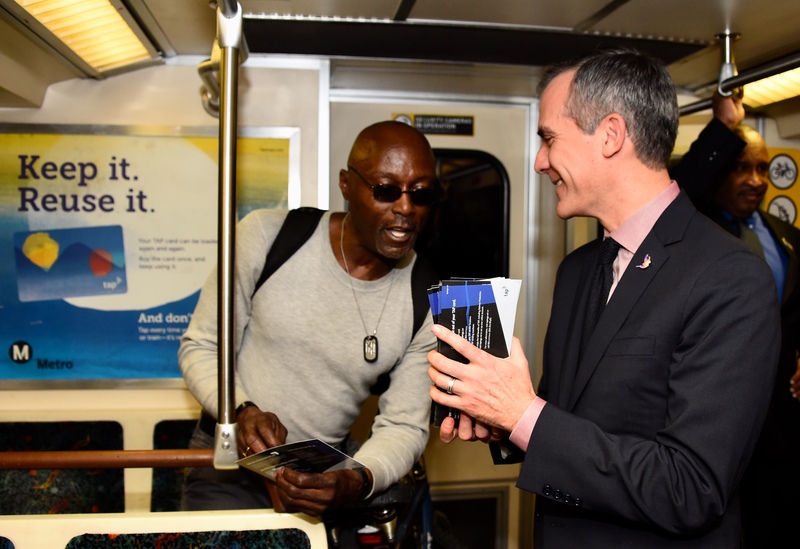 Metro held a media event at Union Station this morning to celebrate and debuted a new commemorative TAP card (see the image at the top) that will be available at TAP vending machines at all Red/Purple Line stations. 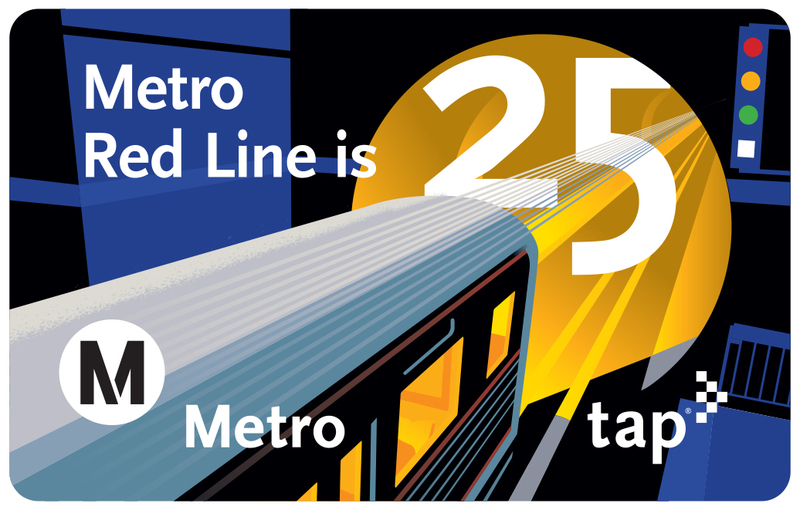 Over the last 25 years, the Red Line has carried an estimated 817 million passengers while traveling approximately 3.6 billion miles, according to Metro. 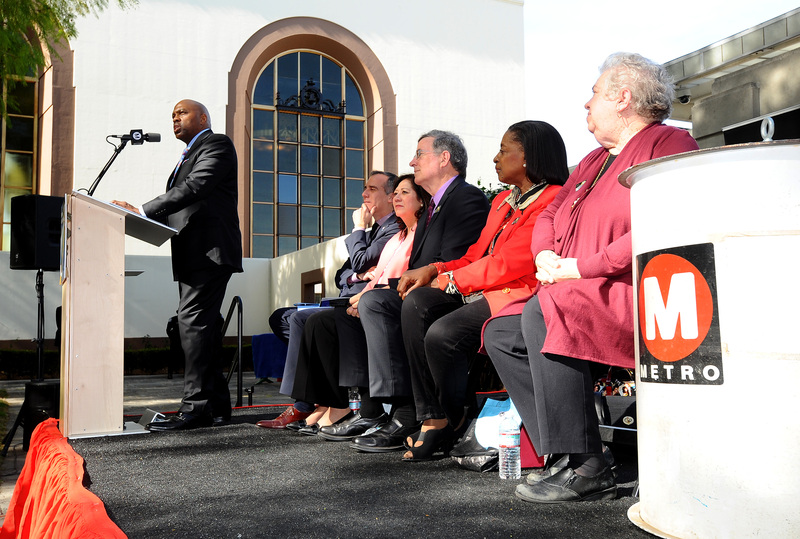 Groundbreaking for the Metro Red Line occurred in September 1986 near the future home of the Civic Center Station. The first 4.4-mile segment opened in 1993 and included five stations between Union Station and MacArthur Park, as well as a rail maintenance yard and shop. In July 1996, the line was extended from MacArthur Park to Wilshire/Western. In December 1999, the next segment opened from Wilshire/Vermont to Hollywood/Vine. The final three stations opened in June 2000, pushing the subway to Hollywood/Highland and Universal City and North Hollywood in the San Fernando Valley. In 2006, the Wilshire “spur” portion of the Red Line from Union Station to Wilshire/Western was renamed the Purple Line. The Purple Line is currently being extended for nine miles to the Westwood VA Hospital. The first segment between Wilshire/Western, Wilshire/La Brea, Wilshire/Fairfax and Wilshire/La Cienega is under construction and heavy construction on the second section to downtown Beverly Hills and Century City will soon be underway. The third section includes stations at Wilshire and Westwood boulevards and the Westwood VA Hospital. Please explain the Pac Elec Ry ‘red car’ in 2 of the photos above (taken Jan 1993). I assume it was the one owned by Richard Fellows (now deceased) with a gasoline motor & rubber tires. Where is it now? What is its history? As I understand it, that Red Car was converted back to rail and electric service and ran down in San Pedro. The first segment of the Red Line opened on January 30, not January 29, 1993. And cheers to all of those who fought to revive subway construction and get the Purple Line extended down Wilshire Boulevard! I’m curious, how much was each phase of the red line budgeted for, and how much did each phase actually cost? And how long was construction on each phase? It’d be incredible to compare how much inflation has impacted subway construction costs since construction began in the 80s and if we are any faster at building subways now, in Los Angeles. 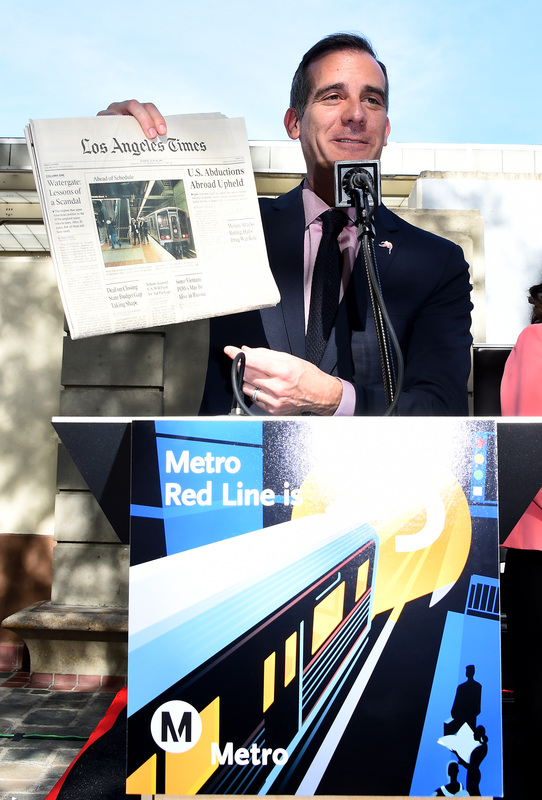 The cost of the Red/Purple Line was $4.5 billion, according to Metro. The Metro Library is a good resource for info about the different phases and budgets: https://www.metro.net/about/library/. There are also considerable media accounts from construction of the subway in the 1980s and 1990s. I recommend trying to the LAT archives or the Los Angeles Public Library. I don’t have that info offhand. There were obviously issues building the subway to Hollywood — and that led to the 1998 ballot measure on using sales tax revenues on subway construction — but I think much of the project construction was uneventful. It’s hard to believe it was 25 years ago that I worried myself sick that everything went OK on the politician’s first train ride! the feeling of relief as they all climbed the stairs to the street after a successful trip was almost overwhelming! It is very gratifying to see the expansion contracts in high gear and I wish Phil Washington and Rick Clarke and the MTA team all the best in the execution of the subway expansion (and other rail projects too!). The distribution of these new TAP cards was much better than other TAP card issued last year. These TAP cards were actually stocked when they were suppose to! Heck, even the day before! A friend got the new TAP card at Union Station on SUNDAY!! He just happened to reload his card after taking the Red Line to Union Station. Another friend got the TAP card at North Hollywood. Another saw the stickers at Wilshire/Western. Both on Monday evening. I was able to get the TAP cards today, Tuesdat, at Sunset/Vermont. I think all the machines had the sticker for the new TAP card. I hope Metro release more TAP cards this year!